In this Year of Mercy the acute need for shelter is illustrated globally by millions of refugees uprooted from their homelands through war, climate change, food and water shortages, economic or political conflict. Refugee resettlement requires the resource of time and patience as well as material aid. Welcoming those who come from other lands and culture and whose first language is not your own, is a major component to successful resettlement. Welcoming newcomers to your street or school; ensuring there is no one who feels a stranger in you company. Visible and invisible issues of homelessness affect many in Aotearoa New Zealand. On these pages some of several agencies and Church-related groups working among the homeless share their stories. All of us need a sense of place, a sense of belonging. Without that we are likely to experience a sense of homelessness – which is what many of those on the streets of Wellington are experiencing. The Wellington Night Shelter is one of more than a dozen agencies in the city that provide support and care for those experiencing homelessness. Currently we provide ‘emergency’ overnight accommodation for 23 men (over 18 years). Each has access to showers and washing facilities and often a meal provided by Kaibosh Food Rescue or another generous benefactor. They sleep in separate lockable cubicles. In addition we provide transitional accommodation for 22 men in a hostel-motel environment where each man has his own room and shared lounge and cooking facilities. Although last year the Night Shelter offered around 16,000 bed nights, accommodated 230 new clients and achieved housing outcomes for 120 clients, we believe we can and should do better in moving more of our clients into permanent and secure accommodation and to wellness. and Income New Zealand (WINZ) procedures. We welcome Hon Paula Bennett’s recent announcement of $41.1m support for 3000 emergency-housing places over the next four years across New Zealand, with 60 places being allocated to Wellington, along with financial support for wrap-around services. We are fortunate to live in a city where compassion and support are available to those in need. That support in meeting the health and wellbeing needs of those on the streets include the Home of Compassion Soup Kitchen, the Wellington City Mission, Downtown City Ministries (DCM), Ngati Kahungunu, Te Aro Health Centre, St Vincent de Paul Society, Wesley Community Action, the Salvation Army, and Catholic Social Services. 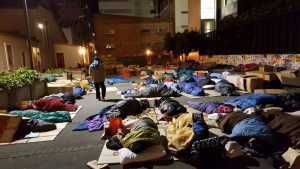 In Wellington, aside from the Night Shelter, transitional accommodation is also offered by the Wellington Homeless Women’s Trust, with long-term accommodation provided in the main by the Wellington City Council, Housing NZ, and Dwell Housing Trust. All these agencies are staffed by dedicated motivated people committed to helping the vulnerable. Please remember that all those people you see on the streets – beggars, including those who may be experiencing homelessness, are on a journey – each has their own thoughts and aspirations and a story to tell. All have suffered deprivation and loss of self esteem. When you see them on the streets make eye contact, acknowledge their existence, ask them how their day is. While material support is important to them, it is more important that you acknowledge their humanity. John Kennedy-Good is Chairman of the Wellington Night Shelter Trust and President of St Vincent de Paul Wellington Area. 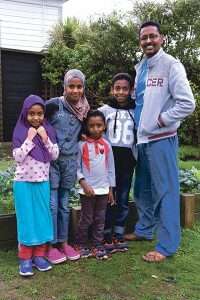 The housing shortage across New Zealand is also affecting new refugee families arriving in Wellington. A number of refugee families are in overcrowded situations, and struggling to navigate our complex system for finding suitable housing. It really does not feel like a warm welcome for these families. Immigration New Zealand appears to be increasingly likely to reject applications under the Refugee Family Support Category (RFSC) where the refugee sponsor cannot provide suitable accommodation for their family. One bright light on the housing front is the model housing project between the Dwell Housing Trust and the Sisters of Compassion. 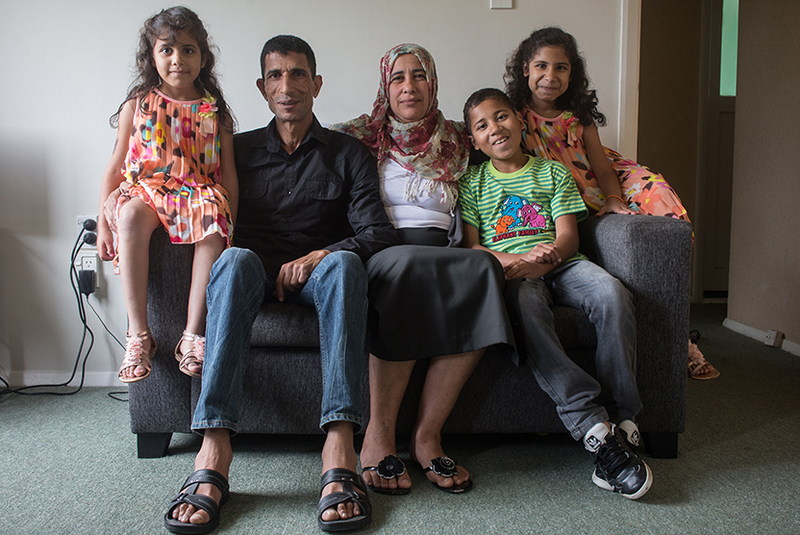 A flat in Wellington’s Island Bay provides transitional housing for refugee families resettling in New Zealand. Since this project started in 2012, five families arriving in Wellington under the RFSC have been helped. They include a family of six from Somalia, a family of six from Afghanistan, a family of ten from Somalia, a family of six from Eritrea, and, a family of nine from Somalia. Sr Rachel Moreno provides ongoing support and assistance to each new family when it is necessary for them to use the flat. This includes fully furnishing the home, providing food parcels, clothing, helping with appointments and meetings, and enrolments at schools and English classes. If a refugee family does not have sufficient income for a short period of time, the Home of Compassion Sisters have subsidised the rent at this property. For the most part, the refugee families have all been able to pay the rent of $350 per week. This housing project is an innovative and practical way to support a refugee family when they first arrive in New Zealand to start a new life here. However, the flat can only help one family at a time, and more homes are needed at a reasonable rent. Landlords willing to rent a property to a new refugee family at a reasonable rate are desperately needed. Can your parish help? St Joseph’s Parish in Mt Victoria has recognised this need and supported two refugee families with housing in a parish property at low rent – they have really provided shelter to the homeless [see story page opposite]. If you are willing to help a refugee family in this way, please contact Amanda Calder at acalder@xtra.co.nz at the Refugee Family Reunification Trust. ‘Two things that the refugees we look after really struggle with are housing and employment. Sometimes they make an appointment with housing-income agencies but they have to wait up to three weeks or more to see someone. That’s why the work of the parishes such as St Joseph providing a temporary house is absolutely vital. Some of the government-related organisations encourage refugees to try and find a house in the private sector but many can’t afford market rentals. I went for an appointment with one family and we were asked to show what we had looked at. The three and four-bedroom rental houses listed on-line that I looked at for the family were around $800 a week. Despite the available housing allowance, many still can’t afford rents being charged. So where do they go? Many end up living with their already large families, which leads to overcrowding. – Sr Rachel Moreno, Sister of Compassion Island Bay. 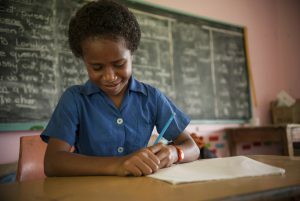 If you would like to discuss possible work opportunities you may have please contact Sr Rachel on email sr.rachel@compassion.org.nz or phone (04) 383-7248. The Archdiocese of Wellington’s Catholic Social Services partners with Red Cross to help set up homes and welcome former refugees arriving in the Wellington region. CSS Director Lesley Hooper says support and goodwill towards former refugees has been overwhelming. Red Cross is the primary provider of refugee resettlement services in New Zealand. The organisation delivers support for up to 12 months as families resettle into our communities. All refugees accepted by New Zealand under the Refugee Quota Programme complete a six-week orientation programme at the Department of Immigration’s Mangere Refugee Resettlement Centre. Families are then resettled in Auckland, Waikato, Manawatu, Wellington, Nelson or Dunedin. Red Cross volunteers welcome and accompany the former refugees into their new homes. They visit frequently during the first few months, helping people understand New Zealand culture and to connect with vital services like healthcare. Former refugees are also supported by Red Cross’ social workers, refugee-background case workers and cross-cultural workers. Support includes the Red Cross Pathways to Employment programme, which helps find employment opportunities. Sitting in their Wellington living room Nazeh and Mirvat talk about their relief at being in New Zealand. Four years ago, they were forced to flee the war in Syria with their three children in 2012. 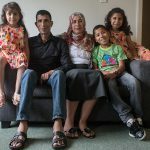 Nazeh and Mirvat are some of the many former refugees who have been supported by New Zealand Red Cross and partner organisations including church groups, social services and volunteers. The idea to make available a house belonging to St Joseph’s Church in Mt Victoria, Wellington, as short-term accommodation to refugee families began with a conversation between Amanda Calder of the Refugee Family Reunification Trust (RFRT), parishioners and St Joseph’s Finance and Property Committee. 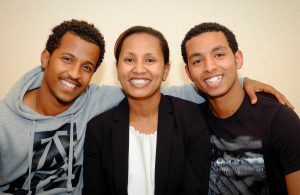 Previous refugee families faced housing challenges when their family members arrived under the family-reunification scheme. So the group asked what parishes could do to provide ‘a landing spot’ to help families to find their feet in their new country. Discussions with the parish finance committee about the pastoral need for the availability of a parish property that could be offered with subsidised rental for social housing led to a house being identified. The property could be offered for short-term rental as an initial base to refugees coming into New Zealand under the Family Reunification Scheme. An agreement was developed between the committee, parishioners and the RFRT. 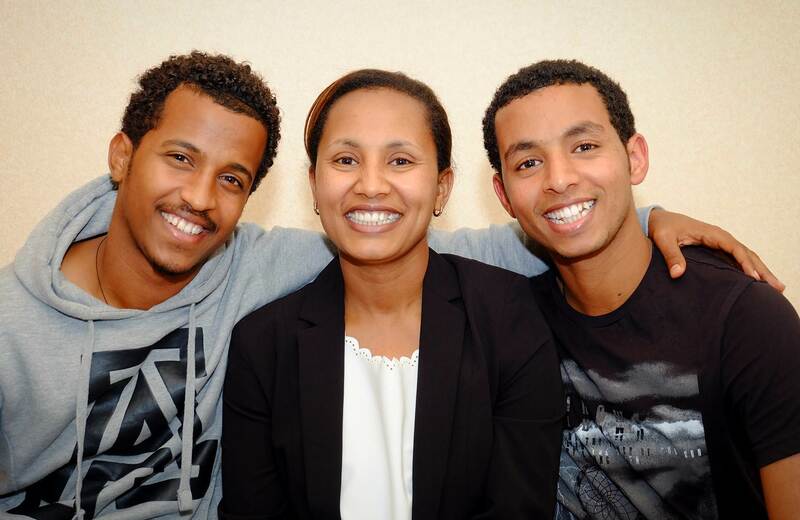 The house has since supported two refugee families, including Yohannes and Tesfit, two young men from Eritrea, North Africa; and a family from Rwanda rejoining family members in Wellington South with children at nearby Catholic Colleges. Parish groups oversee the house’s maintenance and provide support to the family staying there over their initial period. St Joseph’s is part of the new Catholic Parish of Wellington South. Its new leadership team is learning about the project by working with those involved. They aim to develop the project’s direction in line with the parish’s vision for a sustainable and ongoing response to families coming to settle in New Zealand. Provision of such housing is critical for sponsorship of refugees who come to New Zealand under the RFRS and as Immigration New Zealand examines adequacy of housing plans. In this Year of Mercy it is an opportunity for parishes to look at how they can take steps to provide social housing. Members of the Challenge 2000 youth group in Johnsonville with Cardinal John Dew during their Caritas Challenge. Walkathons, dance-offs, pilgrimages and sleeping overnight in cardboard shelters were just some of the many ‘challenges’ undertaken by schools and youth groups across the country for the Caritas Challenge in April this year. 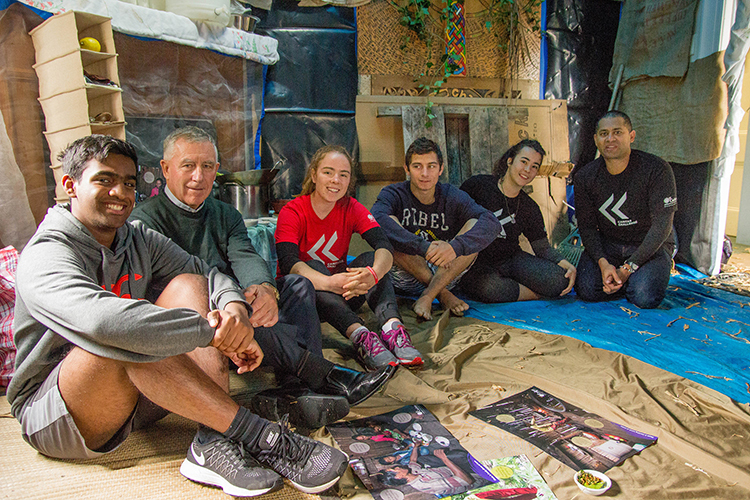 Aimed at raising awareness about social justice issues in the world, as well as raising funds for Caritas Aotearoa New Zealand, the Caritas Challenge helps young people understand aspects of what people living with poverty and injustice experience on a daily basis by taking on ‘challenges’ for a 24-hour period. Each year the Caritas Challenge features a specific country in which Caritas is delivering a development programme and this year Cambodia is featured. Caritas’ work in the country is focussed on helping indigenous people improve their farming techniques and adapt their crops to a changing climate, providing access to clean water and land rights. Games and activities are also developed by Caritas each year to teach participants about living conditions in the focus country. More than 8,000 young people took part in this year’s event, which was launched by schools and youth groups in each diocese on 1‒2 April and ran until 15 May. Participants sleeping out overnight at the 14-hours homeless event for World Homeless Day on 9 October last year. The Year of Mercy and the growing awareness of homelessness in our country are important reminders of the Wellington Homeless Women’s Trust being established in 2012. The Trust was the initiative of four Wellington women – Sr Raye Boyle, Sr Catherine Hannan, Karen Holland and Sr Marcellin Wilson. They responded to a plea for help in 2010 from Wellington Police for temporary accommodation for two women being evicted from their flat with nowhere to go. The group was motivated by their shared dedication to the Works of Mercy, a conviction that the scriptural vision to ‘Shelter the Homeless’ meant women as well as men, and because the women deserved dignity. 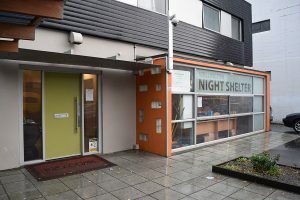 The Men’s Night Shelter had been part of the Wellington community for over 40 years but somehow women at risk were not considered to have the same needs. A facility with six bedrooms, dining-lounge, shower, kitchen and laundry was found and the women’s shelter has been fully occupied since. Homeless women have come from Arohata Women’s Prison, the mental-health wing of Wellington Hospital, and eight referral agencies from Wellington’s homeless sector. Stories shared by some of the women are online at www.homeless.org.nz. We provide support and accommodation up to about three months for homeless women who want to improve their situation. We look into a woman’s case, figure out what will help them and try to put them into permanent accommodation. We’ve even got employment for some of the women. We want them to be able to stand on their own two feet. It’s also important we’re restorative. You don’t just feed, you find out why people are hungry. You don’t just look at poverty, you find out what is causing it. In this Year of Mercy it is gratifying to know doors are open in our city for our homeless women for a period of three months until they have been able to restore their dignity and have gained resilience to take up the threads of their lives again. Financial support for the homeless women’s shelter has mainly been from women. Our needs are ongoing and you can help by donating through www.givealittle.co.nz/org/homeless-wn or Kiwi Bank account 38-9014-0567519-01 or direct to Wellington Homeless Women’s Trust, PO Box 1784, Wellington 6140. Sr Marcellin Wilson CNZM is Treasurer Homeless Women’s Trust Wellington. Crispin Anderlini is Communications, Marketing & Fundraising Adviser, Caritas Aotearoa New Zealand. He gives a personal account from his visit to Fiji in April on behalf of Caritas. From remote hillside settlements where families continue to huddle together in a single house, to a village having to manage the devastation in isolation because of a disease quarantine, the effects of Cyclone Winston, 19 February this year, are still fresh for many in Fiji. Our task during this particular journey was to listen to their stories and experiences, and by doing so provide some outlet for them to share with others what they’re been through. We also sit alongside them in houses, schools, evacuation centres and under broken eaves in roofless houses to assure them we are there to help. 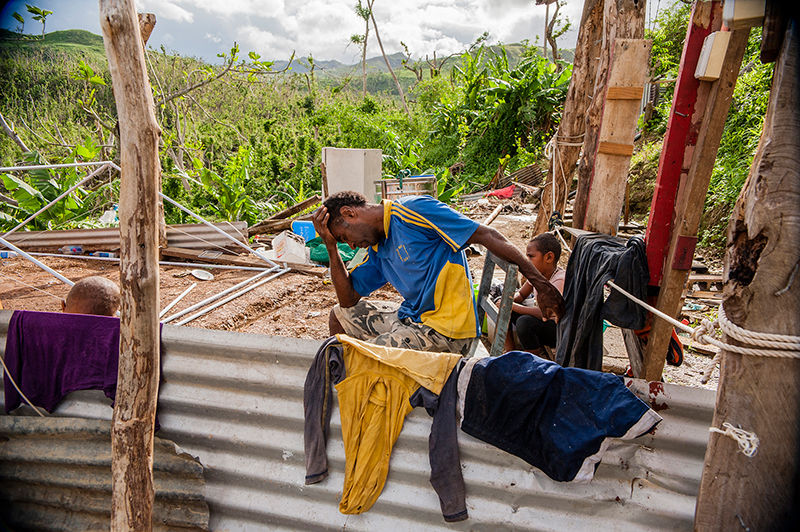 Psychosocial support through counselling is an important way the CJD and Caritas are helping those affected by Cyclone Winston to overcome their trauma, and will no doubt be useful for many. Take the example of Paulina Dulaki Naleba, a 10-year-old girl sheltering with her family in Navunibitu Catholic Primary School, Ra Province, where she is a student. Speaking with a soft voice about the category five storm, a look of tired pain beyond her years clouds her youthful face. Head in hands, her father sits nearby reliving it with her and considering the loss of their house and possessions.